The ladies will be starting a new Bible study next Monday, September 14th at 6:45 p.m. Any women who want to be encouraged and challenged in their faith are welcome to attend. 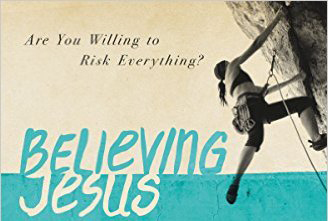 Going through Lisa Harper’s book Believing Jesus, the ladies will meet at the parsonage (right next door to the church) every other Monday evening. “Are you willing to risk everything?” That is the question Harper’s book asks and challenges you to consider. Ladies, we hope you’ll join this study and invite others, too. If you have any questions, please contact Katie Humphreys at kthumphreys@gmail.com. Nicholas Drake liked this on Facebook. Judy Borman liked this on Facebook.